00:07:11 Retweeted @davepell 00:06:05 Please remember that Trump fired Sessions and hired Barr specifically, and solely, because he was angry that Sessions wasn’t obstructing. 00:14:26 I wonder if it will be possible to find a link to the report on Twitter once it is posted. I’m worried it will be difficult to find. 05:09:48 Retweeted @jaredbkeller 2019-04-17 23:59:30 [INT. A diner in Iowa]ME: How is your last name pronounced? 05:18:11 Retweeted @PreetBharara 2019-04-17 22:18:26 I’m preparing my own counter report. It will be comprised of many sections, each less than 280 characters. 14:14:05 So, interesting news conference. But mostly ignorable. We’ll see what we see later today. Most interesting thing to me was that Barr is going to give a less redacted copy to congressional leaders… but still without the 6e info, which he doesn’t want to file a court motion about. 16:34:03 Retweeted @ChrisWarcraft 16:26:46 So basically the redacted report is “Trump was too dumb to commit these crimes properly but REALLY wanted to commit crimes which by the way is still an impeachable offense” and they’re trying to spin that as a win? 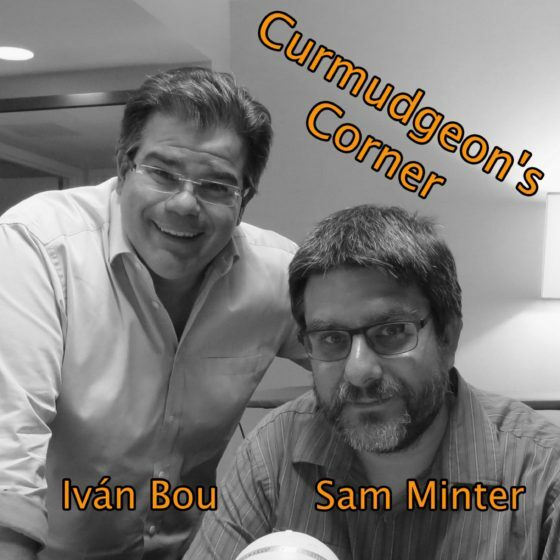 16:57:19 By the way, we aren’t recording the Curmudgeon’s Corner podcast until TOMMORROW night, so we’ll be able to respond to more fully digested responses to this report, rather than instant reactions as people are skimming and speed reading. 17:48:46 Retweeted @ElieNYC 17:10:34 Jesus Christ. Only 10 pages into the obstruction section, but the contrast b/w it and the Russia section is striking. Russia Section: It all looks bad but criminal conspiracy is hard to prove. Obstruction section: This is easy to prove for anybody with the authority to do so. 19:31:03 Retweeted @maxbergmann 18:35:00 The press need to stop saying there was no “evidence of collusion.” That’s Barr’s spin. The report is FULL of evidence of collusion. Mueller just said it didn’t legally amount to a criminal conspiracy. 21:18:56 Retweeted @RadioFreeTom 21:09:22 I have been on the road all day, and I am just now reading up on today’s events, and I’ll just say:Every Trump shill who demanded an apology from the Trump-Russia folks owes the Trump-Russia folks a big goddamn apology. There was no crime. Fine. The rest of it is disgusting. 22:14:56 Retweeted @normative 22:04:14 So, the full report reinforces my reaction to Barr’s summary: An inquiry focused on whether there was an “agreement”—a legal prerequisite for a conspiracy charge—definitionally omits the kind of public quid pro quo we all witnessed playing out. 23:50:16 Retweeted @samstein 14:17:59 The basic rationalization Barr gives for why Trump didn’t legally obstruct justice is that he was emotionally upset about being accused of potential crimes and bad media coverage and acted out. That’s the actual argument the Attorney General of the United States made. 23:21:35 Retweeted @joshgerstein 23:18:12 Senior DOJ official confirms report will be going to Hill between 11A and 12N on compact discs…….still no word. Plan is to post report on Mueller website after it is delivered to Hill. No exact time given. Taken by “Ciel Austral” in Chile. 00:14:47 Retweeted @MrDane1982 2019-04-14 23:42:50 Observation…Kamala Harris campaign is the only one that reflects the Democratic base, she released 15 years of tax returns, an estimated 22k people showed up to her presidential announcement and she’s beyond qualified and experienced. 01:06:02 Time to start muting Game of Thrones stuff. I intend to watch eventually, but I’m still a few seasons behind. 17:49:47 Retweeted @ThePlumLineGS 14:15:51 Let’s be blunt about this. The real aim of Trump’s attacks on @IlhanMN is to incite hatred towards US Muslims, and to silence a vocal advocate on behalf of their rights.We know this, because he’s confirmed his true aims, again and again. 22:58:35 Retweeted @kylegriffin1 22:26:55 The House Intel and Financial Services Committees have issued subpoenas to Deutsche Bank and numerous other banks, seeking info about Trump’s finances and the lenders’ business dealings with Russians, people with knowledge of the investigation tell NYT. 06:53:42 Retweeted @_EthanGrey 04:33:36 It really is time for white Democrats to get over their fear of not winning over people who voted for Trump. We do not need them to win, and our politicking should stop being shaped by fear of what they will do.Stop trying to see yourselves in them or ask yourself why you do. 15:29:04 Retweeted @_Political_Nerd 15:02:44 2020 will be the first presidential election in which there will be voters who were born in the 21st century. 15:29:59 Retweeted @mxrk 14:37:25 If I were Lou Bega I would simply renumber my mambos so the best one came first. 18:07:13 Retweeted @_Drew_McCoy_ 18:02:19 Say what you will about George Lucas (and I’ve said quite a bit) but he created something that we’ve been talking about and unable to look away from for over 40 years.That’s pretty astounding. 19:30:43 Retweeted @HoarseWisperer 19:27:24 Earlier this week, I found myself at the scene of a murder.I’m still a bit haunted by it. So, I’m going to talk about it. 21:26:13 Retweeted @thisgreyspirit 01:48:59 (1/7) So apparently some (I hope very few) people online are using the fact that I am the primary developer of the eht-imaging software library ( https://t.co/n7djw1r9hY ) to launch awful and sexist attacks on my colleague and friend Katie Bouman. Stop. 21:29:14 Retweeted @tribelaw 20:24:30 If true, this is the most obviously impeachable action Trump has taken to date: It would mean this president has seized the power to put not just himself but all who do his bidding beyond the reach of law. Any such president must be removed at once. 22:48:57 Retweeted @rtraister 22:48:18 Ugh I want the movie that would have been made if Carrie Fisher hadn’t died. 11:11:55 It will be interesting to see exactly what the charges and evidence are against Assange. If it turns out to be solely about “journalism” type activities, I may join those upset by going after him. I would not like that. But I strongly suspect there is more to it than that. 2008 Dem: Clinton led by 13.8 points. 2008 GOP: Giuliani led by 16.4 points. 2012 GOP: Romney led by 5.8 points. 14:47:52 Retweeted @sahilkapur 13:49:09 NEW: @EWarren rolls out a new plan to impose a 7% tax on corporate profits above $100 million, “no loopholes or exemptions.”It would raise $1 trillion in revenue over a decade, per two UC Berkeley economists.